Redbet Poker fantastic MCoP promotion encompasses 8 events over 8 days every month, and has a Total Guaranteed value of €550,000!!! 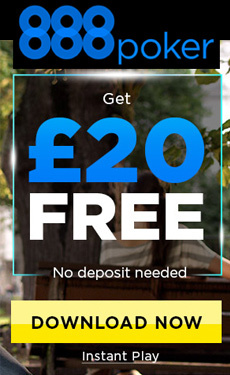 Plus a €50,000 Bonus Prize every month. The next MCoP starts on the 7th of March. BUT THAT’S NOT ALL! €50,000 BONUS PRIZE EVERY MONTH!!! 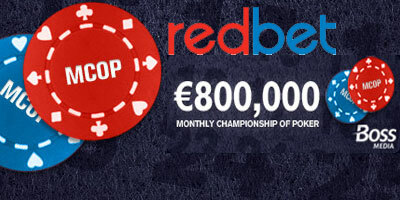 Redbet has put up a prize of €50,000 for any players who achieve 3 final tables within any one of the MCoP series. The MCoP Final’s will all be Shown in Purple in the Client. Check the Multi Tourney lobby for further information. The Promoter of this promotion is Redbet. Any player who finishes within the final 10 players (final table) in any 3 of the 8 events in each month will win a share of the €50,000 prize, credited within 72 hours of the close of the promotion: If more than 1 player achieves this, then the €50,000 will be split evenly amongst all winners. If a player achieves 3 final tables or more within the iCOP4 or each MCoP series he/she will receive the same share as all other qualifying winners. The 8 events which are valid for the €50,000 final table prize are the iCOP4 &/or MCoP tournaments listed above. Each MCoP is a separate series, and as such the 3 final Tables need to be obtained during the same calendar month. In the event of a service crash or a disruption, the promotion for that day will be rerun at the discretion of Redbet. Redbet will be the sole arbiter as to whether a promotion will be rerun. Redbet accepts no responsibility whatsoever for system or connection problems that might affect any player during any of these promotions, such as a fold / timeout. The promoter reserves the right to refuse this offer to any player or to withdraw this / or part of this offer / promotion at any time. The Promoter cannot be held responsible for any 'fold / timeouts' or disconnects as per the general rules of the Redbet Poker service. If the game is disrupted by system or network issues Redbet reserves the right to resolve the issue as it sees fit. Redbet reserves the right to amend the tournament rules at any time. All winning accounts are subject to standard Fraud and Security checks to ensure compliance with Promotional and General Network T&Cs. Any accounts found to be in breach of Fraud or Network rules will be locked and disqualified from the promotions. Multiple account use will result in disqualification and account closure. Any players found to be “soft playing” or “team playing” in qualifying tournaments in order to enable a player to further his position will be disqualified and all accounts will be suspended. Any abuse of the chat facility during qualifying tournaments will result in disqualification and account suspension. No director, employee, consultant or agent of Redbet or any of its group of companies or its suppliers, vendors or white label partners is eligible to participate in any of the above promotions directly or indirectly, nor is any supplier or vendor. This restriction also applies to relatives of such persons and for this purpose 'relative' includes, but is not limited to, any of a spouse, partner, parent, child or sibling. Any player who wins any of the promotions has the right not to participate. There is no cash alternative. In this instance, Redbet• will usually pick the runner-up as the replacement, subject to their total discretion. By participating in the tournament you agree to reasonable publicity, including betting markets around the event and television media interviews and press releases. Event reports will also feature the name and alias of the winners.